Sure I'd like to be cooking with tomatoes about now, but since our tomato harvest was a bust (I'm still holding out hope for the green fruit that has finally sprouted on our vines) I've started preparing some fun dishes with our Serrano peppers. We have one very productive plant, and faced with an abundance of hot chilies, I began seeking out recipes calling for them. 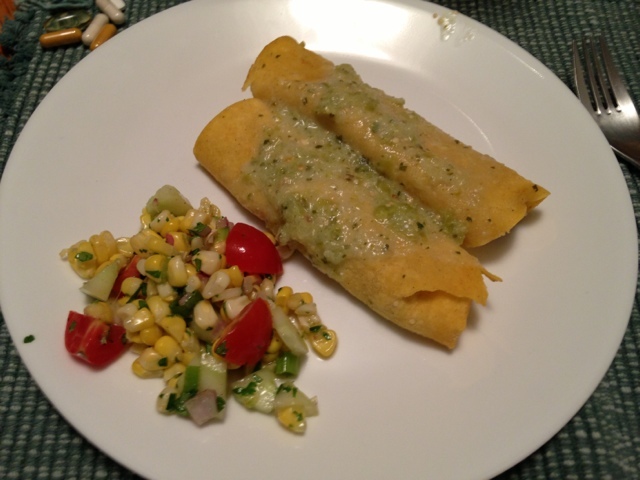 I found one for Chicken Enchiladas Verdes at Simply Recipes through Tastebook (my favorite food app). I'm new to cooking Mexican food (though not eating it) so it was a fun experience and it turned out to be a tasty--and spicy--meal. Fresh corn salad with cucumber, cherry tomato (from a farm stand), red onion, cilantro and a mustard vinaigrette made the perfect side dish. Next, I will try my own hot sauce with a recipe from my friend Kim in Tejas. I can already feel the burn! 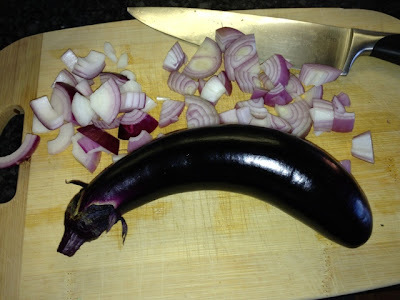 Oh, p.s., if you are cooking with hot peppers be sure to wear gloves! I got a case of hot hands last week that kept me up half the night. After trying soap and water, aloe, olive oil, and a few other Web remedies, I rubbed ripe banana all over my hands and the burning finally subsided. Maybe the enzymes in the fruit neutralized the capsaicin. I'm just glad it worked. That didn't take long! I removed the nets from my blueberry bushes and within days the Mockingbirds were back. I woke this morning to the sound of chirp chirp. I thought they'd left town since I hadn't seen or heard from them since one had slipped under the net and I had to help it get out. That was a few weeks ago.But these are persistent little buggers. As I peered out my window, I saw the grey bird on the terrace railing, berry in beak. It did a head tilt, a quick swallow and off it went, laughing, I'm sure. Well, it's end of season and there are just a few berries left so what the heck. Go to town little critters. Enjoy the fruits of my labor! 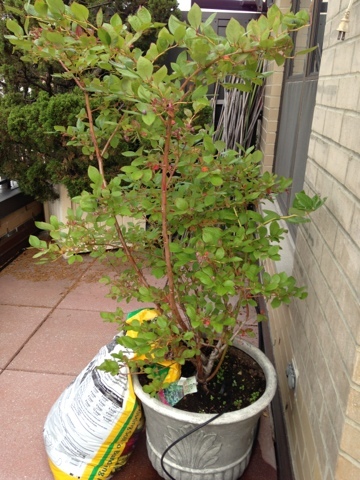 This Jersey berry bush was netted last week. Now it's fair game for the birds. Finally, we have tomatoes. Tiny green ones, that is. 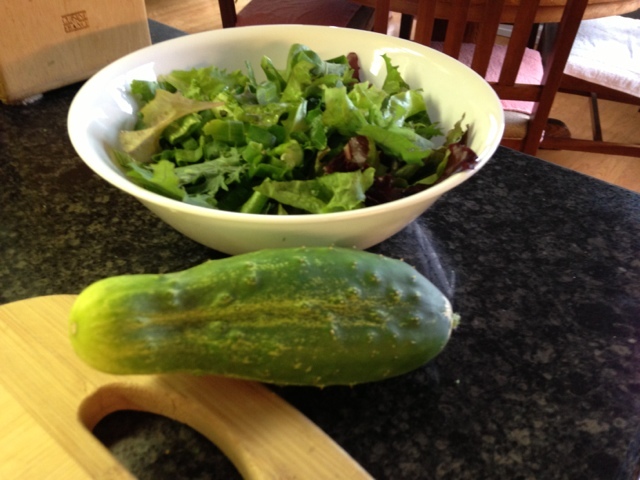 This will go down as the worst summer on record for our garden. 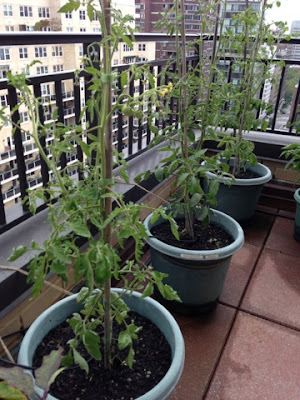 Our tomato plants just never took off. We were a little late getting them in their pots this season, planting them all by mid-June. But I thought they'd catch up. They should be tall and full by now. Instead, the poor things are thin and spindly and they haven't produced at all.The rainy June didn't help.Nor did the steamy July. Our harvest should be rolling at this point, but instead our plants have just begun to fruit. If we're lucky, if we don't get blossom rot, a hurricane or some other mishap, we might have tomatoes by late Sept. Wow, what a disappointment! Fortunately, the lettuce, eggplants, peppers and herbs are doing well. I got a few cukes too, though not the harvest I'd hoped for, and the heatwave knocked off the vines. I was able to save our blueberries from the mockingbirds by netting them. Still, without tomatoes, I'd have to call the season a bust. These plants are way behind schedule. The eggplants are tasty, stir-fried with some green market onions. The lettuce has been loving it this summer. I have had salad all season long.